How Can I Participate in an Autocross Event? How Much Does It Cost to Autocross? Do I Need a “Sports Car”? Do I Earn a Prize if I Win? What Should I Do to Prepare My Car at the Event? Autocross, known as Solo under the Sports Car Club of America (SCCA), is a motorsport, where drivers individually navigate a course designated by traffic cones in an attempt to achieve the fastest time without knocking over cones, which incur time penalties. Most autocross events are held in a large parking lot, and drivers navigate the course one at a time, which makes autocross one of the safest motorsports. Speeds are low (generally less than 60 mph), but the combination of concentration and precision maneuvering leaves many drivers with their heart racing and hands shaking from adrenaline after a run. All drivers must have a driver’s license, a vehicle in good working condition that meets basic safety requirements and an M-rated or SA-rated helmet. Most SCCA regions, including the South Carolina Region (SCR), provide loaner helmets. So if you don’t have one, we’ve got you covered. Helmets are rated by the Snell Memorial Foundation, and in most instances, a helmet’s Snell specification will dictate whether it is suitable for a particular racing application or allowed by a motorsports sanctioning body(1). There is a difference between DOT-approved and Snell-approved helmets. Most autocross sponsors, including SCCA, won’t accept helmets approved solely by the Department of Transportation (DOT). Snell SA Helmets (designated as Snell SA2015, SA2010 or SA2005): SA stands for Sports Application. SA-rated helmets are professional-grade. They are designed for auto racing and provide the highest levels of impact resistance and fire protection. Snell M Helmets (designated as Snell M2015, M2010 or M2005): M stands for Motorcycle. M-rated helmets are designed specifically for motorcycle racing and similar motorsports and offer less protection than SA-rated helmets. Snell K Helmets (designated as Snell K2015, K2010 or K2005): K stands for Karting. K-rated helmets are designed for karting applications and meet the same impact standards of SA helmets but not the same level of fire-retardant protection. ECE R22.05 certified helmets are also allowed and are common at motorcycle shops. Snell’s SA standard requires flammability testing. The M-rated standard doesn’t. SA-rated helmets pass a roll bar impact test. The M-rated helmets aren’t put through that test. The SA standard allows a narrower field of vision than the M standard. Some SA helmets aren’t street legal for this reason. 1. Griswold, Matt. “Racing Helmets 101: How to Choose the Right Racing Helmet.” OnAllCylinders, 10 June 2016, www.onallcylinders.com/2016/06/10/guide-choosing-racing-helmets/. Accessed 25 June 2017. SCR, along with most other regions, have a website and Facebook group or page that lists upcoming events and provide general news about motorsport activities. Contact information for surrounding regions is listed below. Like SCR, most regions allow you to preregister through motorsportreg.com or register on-site. Depending on the region and whether or not you’re an SCCA member, events cost between $30 and $60. SCR events typically cost $40 for SCCA members and $50 for non-SCCA members. In addition, we charge an on-site payment fee of $5, which can be avoided if you preregister for the event. Course designers are required to follow speed and obstacle regulations, as nobody wants to damage a car. Anything is possible, but incidents (beyond cone marks that you can wax out) are extremely rare. You can also rest assured knowing that crashing into another car is highly unlikely since only one car is on course at a time. No, absolutely not! We’ve had everything from a Toyota Prius to compact pickup trucks compete. Cars are grouped into classes based on performance potential. The only requirement is you have a safe car, which is further described in the Preparing for an Event section of this handbook. Some trucks and tall SUVs are not allowed due to the high chance of them rolling over upon turning. Please ask the event organizer ahead of time if you’re concerned. SCR awards first, second and third place stickers to the winner(s) of each class. These stickers are printed with the SCR logo and are color coded based on the place (e.g., blue for first). Other regions hand other different memorabilia. All SCCA Solo programs operate under the current year’s SCCA® National Solo® Rules, which can be viewed and downloaded from the SCCA website. As a driver, you need to be familiar with two basic rules: car classing and scoring. The Street category is designed for bone-stock cars with some exceptions, which include some cosmetic parts, a sway bar, shocks and tires (provided they are at least 200 tread wear and fit the stock wheel size). The Street Touring category is designed for cars equipped with a common suspension and engine modifications compatible with street use. The Street Prepared category was initially designed to accommodate predominately street-driven cars that have been rendered “inappropriate”; that is, have been modified for motorsport use. The term street-driven is quite subjective, thus, this category serves as a median between Street and Street Modified. The Street Modified category is designed for cars that can be driven on the street and are equipped with drivetrain and suspension modifications that are beyond those allowed in Street Prepared. The Prepared category is designed for high performance, production-based nonstreet-driven cars of a unibody or tub-based construction. The Modified category is designed for cars altered in excess of Prepared, sports racing and two-seat specials, Formula cars, single-seat specials, dune buggies and kit cars. Most cars in this category are not equipped with ABS or traction control. All categories listed above are further divided into classes by the car’s make/model, which are designated by a specific letter. For example, a stock Corvette Coupe would run in the A-Street class, while a stock Mazda Miata would run in the E-Street class. This prevents factory cars of different performance capabilities from having to compete against one another. Additionally, most regions allow you to run a PAX (Professional Autocross Index) class such as Ladies or Tire. PAX is a method of handicapping cars. These classes are added onto an existing class, but competitors only compete against those within that PAX class. For example, someone might run Street Modified Ladies (SML). To continue to accommodate for variations among all cars, a PAX handicap is applied to your raw time to obtain the PAX time, and the fastest PAX time wins. An example of how the Ladies class may be calculated is shown below. For a complete listing of modifications allowed for each category, please consult the SCCA® National Solo® Rules. Autocross is a timed event where the fastest time, down to a thousandth of a second, wins. When navigating the course, two seconds are added to your time for each cone you knock over. (That’s a lot of lost time!) And, if you drive off course, that run is disqualified. The figure below shows how a penalty is accessed. As long as the cone is touching the box, it is not considered a penalty. Typically, you receive four to six runs at each event, which last anywhere from 30 to 60 seconds on average. Your fastest of the four to six runs is then used to determine who wins each class. For example, if you’re running A-Street Prepared, your time is compared against those drivers also competing in A-Street Prepared. Being prepared for an autocross event will save you time and frustration. This section explains how to prepare you and your car to complete. Remove all loose items, including the floor mats unless held by factory attachments. Ensure the battery is tied down and secure. Place class letters and numbers on the car using painter’s tape or magnetic/vinyl numbers. Place only your helmet in the car. Set any modifications you need to be competitive (e.g., adjust shocks). All cars competing at an SCCA Solo event are required to pass a technical inspection of the car and helmet. At SCR events, Tech is open from 7:30 a.m. to 9 a.m., so please ensure to drop by anytime during those hours. Are the competitor’s class numbers and letters on the car? Have all loose items, including floor mats (if not held down by factory ties), been removed from the car? Are the tires safe to drive on? Are wheels securely attached with no missing lug nuts? Is the battery securely tied down? Is anything leaking around the engine? Does the helmet meet SCCA safety requirements? You are able to arrive any time after the site opens. Many competitors arrive early to prep their cars and secure a parking spot. 7:00 a.m. If you did not preregister, it’s your first time at an autocross or you’re competing in a new class or with a different number, then you must sign in at Registration. 7:30 a.m. – 8:45 a.m. Unless you’ve been given an annual Tech sticker, you are required to pass through Tech. 7:30 a.m. – 9:00 a.m.
You can walk the course as many times as you want to gain an understanding of where you’ll be driving. SCR typically holds “novice” walks, where an experienced autocrosser will lead a group of drivers around the course to discuss strategies for how to best navigate it. 8:00 a.m. – 9:00 a.m.
During this time, the Solo Director will go over the event rules and assign you to a run group and worker group. 9:15 a.m.
Once all cars in run group 1 are aligned in Grid, the starter will allow the first car on course. 10:00 a.m. If time permits, we host fun runs, where you pay one dollar per run to drive the course again. This gives you extra practice and the opportunity to driver others’ cars with the driver’s permission. 3:00 p.m. – 4:00 p.m.
One of the things that makes autocross less expensive than other forms of motorsports is that competitors are also organizers and helpers. That person who helped you sign the waiver? He or she is probably driving today. The person who helped you register? Yep, also driving. The tech inspector? Well, you get the idea. During the driver’s meeting, you will be assigned a run group to denote when you’ll run and a worker group to denote during which group you’ll work. Descriptions of the workers assignments that you might work are provided below. The Announcer is one of the most visible/audible positions of the event. It is the announcer’s responsibility to announce the happenings of the event, call out each driver’s time and add interesting chatter to the event. Have fun with it! It is a very good idea to ask the workers you are relieving which of the cones are being hit repeatedly by cars on course to position the workers at your station accordingly. Keep an eye on the cones, making sure none are moved or knocked over. If any are moved, they must be repositioned immediately providing it is safe to do so. Do not risk your life for a cone. Inform the Corner Captain of any penalties. 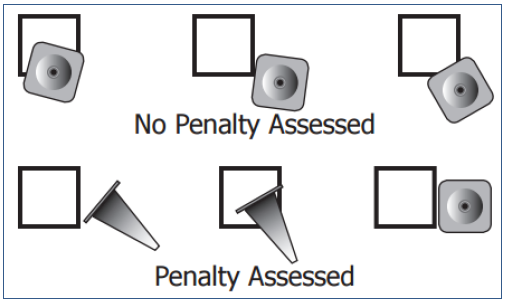 If a cone is displaced resulting in a penalty, raise it above your head to signal the penalty and then reset inside the “box”. If a cone is displaced, but a penalty is not to be assessed, reset the cone inside the “box” and give a “safe” (as used in baseball) or “no penalty” signal to the Corner Captain at your station. Inform the Corner Captain if a car does not go through a gate (providing it does not stop, back up and go through) or drives around an element. This means that the driver is off course (i.e., DNF). Inform the Corner Captain of safety violations, such as if a car is leaking fluids or lost a part on course. Make sure your station has extra cones, a fire extinguisher, a red flag and a radio. Never turn your back to the cars on course. Do not use your phone on course. Stand, do not sit, at your assigned station. You must be ready to move quickly at all times. Although away from most of the action, Waivers is one of the most important functions at an autocross for insurance and safety reasons. Waivers Workers ensure all drivers and spectators sign the Waivers form for insurance purposes and provide everyone with a wristband. Grid is the area where cars line up for each run group and wait “in line” for each run. Grid Workers are in charge of making sure each competitor gets to the starting line in an orderly and timely fashion. When competitors return from their runs, make sure they get parked in the grid correctly and not cause traffic issues. One person should be releasing the cars from the grid to send to the starting line, while the others are making sure upcoming competitors are in their cars, ready to go, with helmets on. The Grid Chief will have a radio to call in any competitors that are out of order or need mechanical assistance. The Starter is one of the more demanding assignments and requires experience. Misjudgment on the part of the Starter can have substantial scheduling consequences. The Starter is responsible for establishing the proper interval for cars on the course, ensuring safe starting distances for all cars entering the course and holding the start if an unsafe situation develops. Timing and Scoring will be in constant communication with the Starter over the radio. When instructed to hold the start for any reason, acknowledge it to the Timing van and then hold the next driver at the starting line. The Auditor is responsible for keeping an independent, written log of each car, in finishing order, including its elapsed time and any penalties. Accuracy and neatness are critical, as they must pay attention to the timing console and the cars on course. This log is used as a backup method if the computer fails or a time is later questioned. The Timing Operator is one of the most critical positions during the event. This person is responsible for course control while cars are running. The Timing Operator must be familiar with the radio protocol and be able to communicate effectively with Course and Grid Workers. Special training is required for this position. Want to know more about autocross? The SCCA’s Autocross page includes not only tons of information about autocross and other forms of motorsports as well. If you’re looking for region-specific information, such as an event schedule or points standings list, visit the specific region’s SCCA site. Information about SCR is can be found at https://scsportscar.com/. We do not have a forum but communicate happenings, club get togethers and share modification and driving tips with one another via our Facebook page (https://www.facebook.com/groups/scrsolo/).